MONROE, Ohio — An Ohio minister recently rode a live bull during a Wednesday night service in an effort to win converts for Christianity—a tactic that raised the eyebrows of some that questioned such methods of evangelism. Lawrence Bishop II, 48, co-pastor of Solid Rock Church in Monroe, announced last month in a video that he was going to ride the bull in response to the number of drug-related deaths in America, as well as the bullying that takes place among the youth. Prior to opening Solid Rock, the Bishop family owned a horse ranch and became known for breeding American quarter horses. In 2011, Bishop took over as co-pastor following the death of his father Lawrence I. His mother Darlene serves as senior pastor of Solid Rock and travels the country to preach. She lives in the lavish ranch house that she and her late husband built. 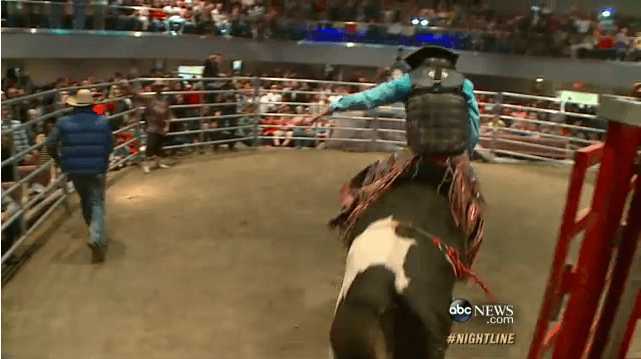 This month, Bishop told ABC’s “Nightline” that he believes he is following Christ’s command to evangelize in seeking to attract the lost by methods such as riding a bull in the sanctuary. He rode a horse during a service on a previous occasion. “We call our church an extreme church because we don’t do anything just normal. My husband used to say the seven last words of a dying church is ‘never seen it done this way before,’ and so that’s what we’re known for is doing things to the extreme,” she said. Bishop said that after riding the bull that night, named Bonecrusher, approximately 300 people came forward to be baptized. A similar effort made headlines last year when Faith Chapel Christian Center, a megachurch near Birmingham, Alabama celebrated the opening of its $26 million dollar, six-dome entertainment center, which features a a 12-lane bowling alley, a basketball court, a fitness center, a banquet hall and cafe, a teen dance club, and an adult alcohol and smoke-free night club. However, not everyone concurs that such tactics are Scriptural or mirror the church model in the book of Acts. David Whitney, pastor of Cornerstone Evangelical Free Church in Pasadena, Maryland, told Christian News Network that using entertainment to draw the lost is an unbiblical means of evangelism. He said that the Church is not supposed to attempt to attract the world to come into its doors, but to go out into the world and preach the gospel—a message that is not very entertaining.